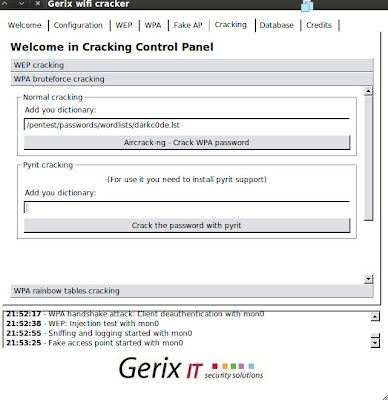 In the previous post we saw how to hack WEP key using the Console and the Fern WiFi Cracker, now we shall be hacking the WEP using a different tool/utility called as Gerix Cracker that is already installed on Backtrack 5. It is a GUI based application which is used to hack WiFi. Once you see the visual interface select the configuration tab . Now you need to enable Set Random MAC and Enable Monitor Mode.First click on the WiFi interface and then Enable Monitor Mode. Then, Rescan the network and select the channel. Now Click on the WEP tab and click on the ' Start Sniffing and Logging . You can also check out in the database to store it!